Starting in 1990, aerodynamic designs returned to the automotive landscape, replacing the angular shapes that dominated the 1980s. The Chevrolet Camaro received a new and welcome redesign that modernized the brand in 1993, retiring the 11-year-old third-generation Camaro. The new Camaro was a technological breakthrough. Only the rear quarters and hood were steel, while the doors, front fenders and trunk were composite plastic. Front suspension was by coils and unequal A-arms and steering was changed to power rack-and-pinion. Rear suspension was still live axle with coils and multi-link. Overall, the new Camaro had a stiffer ride, which was welcome news for most enthusiasts. The engine lineup included a 3.4-liter, 160-hp V-6 and a 275-hp, LT-1, 5.7-liter V-8 in the Z/28. Buyers had a choice of a four-speed automatic transmission or Borg Warner’s T-56 manual 6-speed. Car and Driver found the new Camaro faster than the Mustang Cobra, with 0-60 mph achieved in 5.3 seconds, a quarter-mile time of 14 seconds flat at 100 mph, and a top speed of 150 mph. Upon its debut, only a coupe was offered, but a convertible quickly joined the Camaro catalog in 1994. The following year, buyers could once again purchase their Z/28 with a drop top as well. 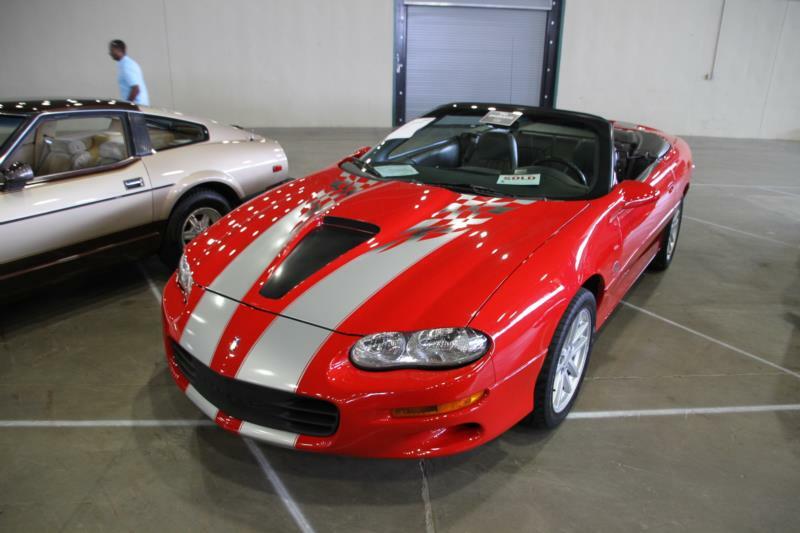 Several optional trims were available during the Camaro’s fourth generation, most notably an Indy 500 pace car package in 1993, and a $575 30th Anniversary package for 1997, which decked the standard Z/28 out with orange stripes and a black-and-white Houndstooth interior. The famed SS Camaro returned in 1996 with sequential port fuel injection, a cold-air induction system and free flow exhaust. The net result for this configuration was 305 hp, and standard Posi-traction helped spin the rear tires to a tune of to a quarter-mile time of 13.8 seconds at 101.4 mph. By 1997 all Camaros came with 4-wheel disc brakes with ABS, and dual airbags. The Z/28 included a 6-speed transmission. The base Z/28 engine generated 285 hp, while ordering the SS package installed the 305-hp LT-1 engine. For 1998 the Camaro received restyled aero headlights, hood, and fenders, while the WU8 SS performance package got the potent aluminum block LS-1 V-8, a new forced-air induction system good for 320 hp and a top speed of 160 mph, and a new rear spoiler. Another Car and Driver shootout in 1999 rated the Camaro Z/28 as the best everyday driver. Nonetheless, as the car aged, sales slipped. By the time Chevrolet announced its intention to cease production of the model altogether, production numbers were a third of what they were in 1994. The news revived interest somewhat, however, and the final year’s run rose from the usual 30,000 to 40,000 units. Even though Chevrolet revived the Camaro name in the 2010 model year, the fourth generation car is mainly remembered as the bookend to 35 years of continuous production of one of America’s most popular cars. And since so many owners stashed their car away as soon as there was no such thing as a “new” Camaro, there are now plenty of pampered, low-mile cars to choose from, especially from the last few years of production. These later cars in particular have plenty of scoot and can be a blast to drive, and serve as a serviceable close to the original Camaro story.